A yummy and super easy cheesecake! A cheesecake in the slow cooker, in fact. I like using the slow cooker for an “oven” because it is environmentally friendly. The crockpot is much smaller than the oven, so uses less energy, and does not heat up the kitchen. It takes a bit of trial and error to use the crockpot this way. For the cheesecake you will have to find baking dish to fit inside. There should be at least ½ to 1 inch between the crockpot and the dish, enough room that your fingers fit comfortably into the opening to be able to handle the dish safely. I used a round quart and a half soufflé dish that fit into my round crockpot perfectly. If you would like to make “handles” for your baking dish, measure a piece of aluminum foil long enough to go across the bottom of your slow cooker and up BOTH sides so that it rises above the edge of the crockpot. Fold the aluminum foil into quarters lengthwise and place it inside the slow cooker before you place the baking dish. The crust question – I often omit crusts because it reduces the carb count of the finished product. This time I lined the bottom of baking dish with vanilla wafers because I had them on hand, but I think ginger snaps would work as well. Neither of these require additional sugar. You could crush them if so inclined and sprinkle the crumbs into the bottom of the dish. Or you could use a standard graham cracker crust. Or just graham cracker crumbs sprinkled in the bottom of the dish. Or nothing. I vote for the “little work as possible” option! Almost as important a factor as the carb count! Add the remaining ingredients to the mixer bowl. Eggs can set for a few minutes in warm (not hot) water and cream cheese can go in the microwave for 30 seconds on half power, if you need to hurry up the room temperature requirement. (Why would I know those things? Experiments “in the name of science”,of course. What did you think? Well — you could be right!) Beat at least two minutes until fully mixed and no lumps visible. Light and fluffy here makes the cheesecake rise evenly with a nicely finished texture. Cook on high for 1 to 2 hours until surface is no longer shiny and the cheesecake is firm around the edges and seems mostly set in the middle. When you do this for the first time, check after the first hour to see how things are progressing. Cooking time will vary with your particular slow cooker and the depth of the baking pan you choose. I start with hot water in the crockpot and mine finishes in about an hour and 15 minutes. Unplug and let set covered for at least an hour to cool. This helps the cheesecake continue to set up, but also makes it safer to remove the baking dish. Refrigerate. Cut when cold, using knife run under hot water to make it easier. Or just spoon out of the dish. I get 8-10 servings using the 1 1/2 quart baking dish. Serve plain or with embellishment. We used about a teaspoon of homemade low sugar strawberry jam on each piece, but you could use a chocolate syrup, grated dark chocolate, cherries, or whatever takes your fancy. Enjoy! 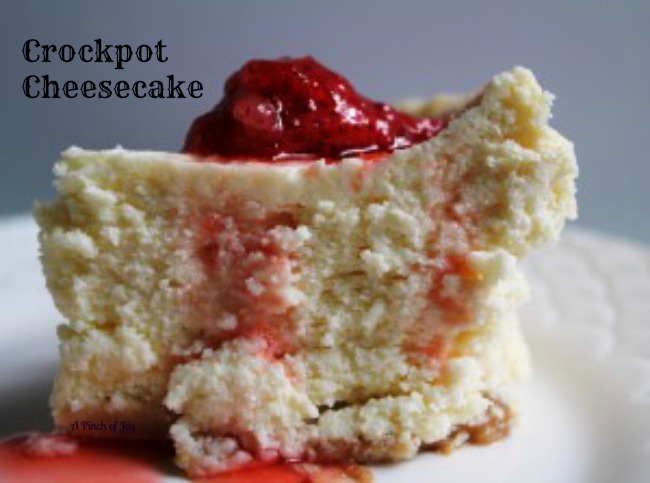 Cheesecake made in the crockpot. Perfect for hot summer days. Or anytime you want to make quick, easy and cook while you work dessert. Crust optional – see notes above. Spray baking dish with cooking spray and add crust, if using. Set in crockpot that has approximately one cup of water in bottom. Beat Cream cheese and sugar until well mixed, add remaining ingredients. Pour cheesecake mixture into baking pan, in the crockpot. Cover and cook on high 1-2 hours. Cheesecake is done when firm to touch, and glossiness appearance is gone. Remove dish from crockpot and refrigerate two hours or longer before serving. Approximately 8-10 servings depending on the size and depth of dish. -15 carbs per serving without crust, less if using artificial sweetener.